Linkin Park singer Chester Bennington was found dead Thursday in an apparent suicide. He was 41. 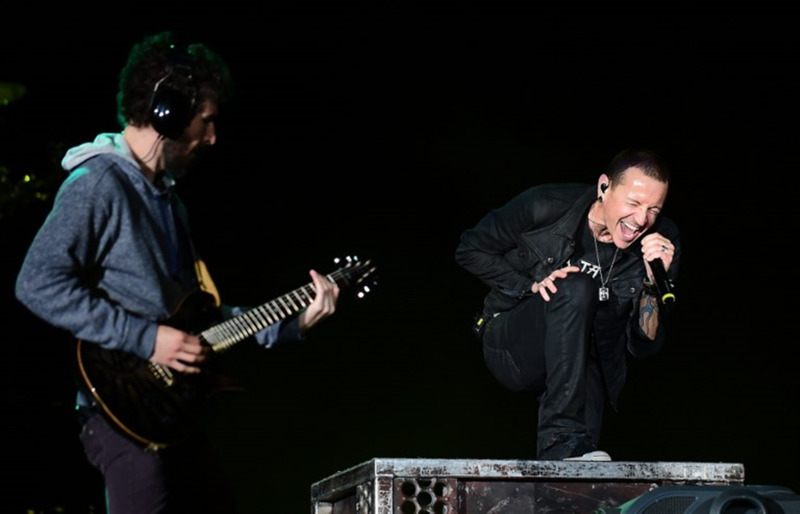 This file photo taken on May 9, 2015 shows Linkin Park, fronted by lead singer Chester Charles Bennington (R), perform on day two of the 4-day, double weekend Rock in Rio USA 2015 music concert in Las Vegas, Nevada. Linkin Park singer Chester Bennington, who overcame a troubled childhood to top the charts with an angry but melodic brand of metal, was found dead Thursday in an apparent suicide. He was 41. "Shocked and heartbroken, but it's true," Linkin Park's guitarist and main songwriter Mike Shinoda wrote on Twitter. The Los Angeles County coroner's office said it received a call just after 9 am (1600 GMT) that Bennington had been found hanging at his home in the luxurious Palos Verdes Estate area. "It is being handled as a possible suicide," said Brian Elias, chief of operations at the coroner's office. Just hours before his death, Linkin Park had released a video for its latest single, "Talking To Myself," whose lyrics took on a new meaning. The song appears to take the vantage point of Bennington's wife, Talinda Ann Bentley, as she begs him to control his substance abuse. Bennington -- who had six children from two marriages -- had wrestled with alcohol and drugs since he was a pre-teenager and he coped with his parents' divorce. "I was getting beaten up and being forced to do things I didn't want to do. It destroyed my self-confidence," he told the British music site Team Rock in 2014. "Like most people, I was too afraid to say anything. I didn't want people to think I was gay or that I was lying," he said. He turned his rage into music with a growling metal voice. Linkin Park became one of the leading forces in the wave of so-called nu metal which incorporated pop structures and hip-hop, with Shinoda often rapping in between Bennington's vocals. Bennington's start with Linkin Park sounded like the lore of an earlier era. After unsuccessfully trying to make his mark musically in his native Phoenix, a talent scout heard his voice and arranged an audition in Los Angeles with Linkin Park. The band, which had floundered before Bennington's hiring, sealed a record deal with leading label Warner and its debut, "Hybrid Theory," became the top-selling album in the United States in 2001. The album -- which has sold more than 10 million copies in the United States -- produced hits such as the snarling "In The End" and "Crawling," in which Bennington reveals his helplessness in the face of addiction. The latest album, "One More Light," came out in May and marked a stylistic departure for Linkin Park with more pop and electronic influence. Linkin Park has won two Grammys -- including in a rap category for the collaboration "Numb/Encore" with Jay-Z. Bennington in 2013 briefly joined as the frontman of leading grunge act Stone Temple Pilots, filling in for Scott Weiland who died of an overdose shortly afterward. Bennington had spoken of being moved by the death in May of another grunge great, Chris Cornell, the singer of Soundgarden. But there had been little public sign of Bennington retreating from the world. Linkin Park was scheduled to start a tour next week which would include a performance at New York's Citi Field baseball stadium alongside other major acts from the band's generation including Blink-182 and the Wu-Tang Clan. Rockers paid tribute to Bennington including Avril Lavigne, who recalled his kindness when they both played Germany's Rock Am Ring festival. "I can't even deal. Horrible news. To lose one of the best," she wrote on Instagram.